No Sainsbury campaigners were out on Mill Road at the weekend. Most of the independent traders and over 4,000 local residents have signed petitions against plans by Sainsbury to take over Mickey Flynn’s pool hall. 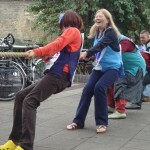 Mill Road Society organised a stall on Saturday with food donated by local traders and a tug of war between a “Sainsbury” team, dressed in orange bibs and an ‘Independent” team. The “independents” won and received the “Keep it Local” trophy. Captain of the runner up Sainsbury Team promised to leave Mill Road in response to requests to “Please leave Quietly”. Sainsbury have applied for change of use planning permission at 103 Mill Road. Information was available on the stall for the public to learn how to object to this application. Campaigners believe that this application proposes a store that is not of appropriate scale and nature and in a position that is an accident black-spot. The pool hall is the only leisure facility in Mill Road and is well used. Objections must be sent to the council before the 29th July. Template objection letter and stall this Saturday! Please find below the much requested template letter for objection to the proposed Sainsbury store on Mill Road. You are most welcome to use this letter but we would encourage you to make it individual and personal to you if possible. The deadline for objections is 29th July 2011. 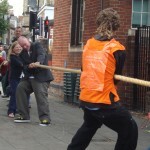 There will be a stall on Saturday as the deadline approaches – outside Mickey Flynn – with music and a tug of war between our own Sainsbury and Tesco teams! Please come along and support the campaign! 1. The snooker hall is a popular leisure venue used by many local people of all ages, particularly young people. It provides an important alternative to the pubs in the area and is the only leisure facility on Mill Road. If it is lost, Mill Road will have no leisure facilities of any kind anywhere on its whole length. 2. Deliveries and increased traffic to this store would pose a serious danger in view of the site. This area of Mill Road is an accident black-spot. The large number of weekly deliveries, made from Mill Road, would cause problems for pedestrians, cyclists, cars, buses and emergency vehicles. The change of use to a Class A1 and the high levels of servicing required by a Sainsbury’s Local would mean a huge increase in deliveries to the site. This will greatly increase the risk to other road users, as the planning inspector found in his judgement against Tesco on Mill Road in 2008. 3. In addition to the risks posed by Sainsbury’s delivery plans, visits to the store by car, including to the proposed ATM machine, will create increased risks for other road users. As people who live near the Tesco Express store on Mill Road know, there is a frequent risk to pedestrians and cyclists caused by cars driving onto the pavement outside the store to use the store and/or ATM. Approving this application will make Mill Road significantly more dangerous than it already is. 4. We already have a large number of convenience and other food stores with a huge variety of foods on sale in Mill Road. Any more convenience food shops will be detrimental to the character of the area and the introduction of yet another national multiple retailer threatens the vitality and viability of the area as a local shopping centre known for independent shops. This would not only be a huge loss to the area but would be contrary to the spirit of the emerging direction of national legislation, in the form of the Localism Bill, as well as to the Cambridge Local Plan. Objections to the proposed Sainsbury’s on Mill Rd must be submitted to the City Council by the 29th July 2011. We need volunteers for a number of tasks that need to be done this week and for next Saturday. 1. A flyer is being produced to be circulated to the houses in and around Mill Road, Romsey and Petersfield. They should be ready by Monday and will include all the details required for anyone to lodge an objection to the planning permission sought by Sainsbury’s on the Mickey Flynn sight. I need volunteers to distribute these flyers. We hope to have them ready as soon as possible (Monday morning). If you can give me a few hours of your time and let me know where you can deliver them I would be grateful. As said before they need to go in Mill Road and of the streets on both side of the bridge. There will be 2,500 of them so there’s plenty to go round. 2. The traffic survey needs more volunteers as well. I’ve had a number of people come forward but as you will see from the attached sheets there is still loads of space on the rotas to be filled. Again if you could spend some time doing this we will be able to have our own evidence as to the potential numbers using the store rather than rely on those Sainsbury’s will give. Please let me know if you can donate any time on this as well. 3. In order to alert people to upcoming date for objections, we are organising an event to take place on Mill Rd by the Bath House on 23rd July from midday to 2pm. Jean is organising this and it would be great if we can make a real presence outside Mickey Flynns. We will be creating a number of vinyl banners as well soon to be displayed around Mill Road to let people know that there is a viable opposition to the proposed store and this event will add to this. Please feel free to bring your own skills to the event if you think they would be useful no matter what they are. We will do our best to incorporate them. This should be a lot of fun and if the weather is nice (unlike today) a great time should be had by all. That’s about all for now. The flyer and a draft objection letter will be circulated on the announcements list soon, so please look out for them. Please feel free to ask any questions about the info in this e mail, and please remember that together we can keep Sainsbury’s of our street. The Mill Road Society was set up by and operated the No Mill Road Tesco campaign. It is now involved in various projects and campaigns that affect the Mill Road (Romsey and Petersfield) area. 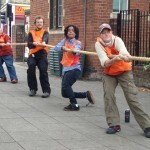 Staffed entirely by volunteers, the Mill Road Society is engaged in celebrating all that is great about Mill Road, a unique multi-cultural area. We organise community actions in response to feedback from the local community.